You may not always get the most accurate information, but one of the easiest ways to learn about other countries is through movies. As I happen to frequent the horror section (which actually doesn't mean anything anymore), I've learned a great deal of foreign soils through scary movies. Some of the most interesting information pertains to rituals and customs. For example, the Chinese film 2002 taught me about burning paper items to send them to the ghost realm. Actually, ghosts figure heavily into many films from the Far East. The latest example focuses on a specific location with The Forest. Sara Price (Natalie Dormer) has always had a strong psychic connection with her twin sister Jess (also played by Dormer). When Sara is unable to reach Jess, who is working as a teacher in Japan, she boards a plane and flies half-way around the world. Once there, she learns that Jess had ventured into Aokigahara, also known as the "Suicide Forest". A vast "Sea of Trees" in the shadow of Mt. Fuji, which is known as a place where people go to commit suicide. Sara ventures here, but meets with little help from the locals. In a bar, she meets Aiden (Taylor Kinney), a travel writer who knows the area. Aiden arranges for a guide (Yukiyoshi Ozawa) to take them into the forest. But, they are warned to stay on the path and to ignore any strange things which they see, as the forest has supernatural powers. However, in her desperation to find her sister, Sara ignores these warnings and soon finds herself surrounded by mystery. Despite that fact that horror movies can be incredibly homogenous, I still love them. But, due to the repetitive nature of the genre, I'm always on the lookout for something. Having never heard of the "Suicide Forest", I was very intrigued by The Forest. (I almost went to see it in the theater, which is a true rarity for me.) I like the idea of learning more about this real place which clearly has cultural significance amongst the Japanese, and represents the kind of thing which we don't see in America. (Or, at least, no one talks about it.) Combined with the "stranger in a strange land" concept of the American Sara venturing into this foreboding place, and you've seemingly got the recipe for an interesting supernatural horror movie. The notion that the locals either don't speak English, or just don't want to help Sara adds an additional air of mystery to the film. So, it's too bad that The Forest is a complete mess. Well, that's a bit of an overstatement. The first half of the film actually does a good job of drawing us in. We meet Sara and learn about how she and Jess are twins, but different, as Jess was always the adventurous one. Sara arrives in Japan and there is the clever moment where Jess' students mistake her for her sister. We witness her journey to Aokigahara and her relief at meeting Aiden. Then, they step into the forest. Just as when the Orca leaves Amity in Jaws to begin the third act of that film, Sara's journey into the "Sea of Trees" should be the point in which The Forest really comes to life. But, this is where the film, not unlike Sara, completely loses its bearing and shows that it has no idea what it wants to be. I don't know how the original script by Nick Antosca, Sarah Cornwell & Ben Ketai (it took three people to write this?) read, but the story completely gets away from first-time feature-film director Jason Zada in the second half. I don't want to give too much away here, but what had seemed to be a straight-ahead horror movie, suddenly decides that it wants to be a thriller as well. Or does it? We get some supernatural moments, but are they really supernatural or are they happening in Sara's mind? We are never told. The Forest turns into one of those movies which is so jumbled and vague that the viewer begins to look for possible twists which never arrive. The movie spirals out of control, making less and less sense, until it finally arrives at a dark ending. Again, I had high-hopes for The Forest, given that I can't get enough of ghost stories, especially those which show us something a little different. I quickly learned that the spooky visuals shown in the trailer are practically non-existent here and the attempts are horror are so disjointed that the movie never gets close to being remotely creepy or scary. (How do you mess up Japanese ghosts?) Natalie Dormer, known to most for her work on Game of Thrones, is good here and rises to the challenge of playing two characters, but she isn't given much to work with and she ends up either looking worried or running through the woods. Is there a Japanese movie about Aokigahara? Perhaps they could get it right. 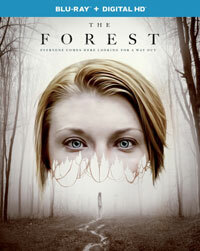 The Forest in The Forest is actually in Serbia on Blu-ray Disc courtesy of Universal Studios Home Entertainment. The film has been letterboxed at 1.85:1 and the Disc contains an AVC 1080p HD transfer which runs at an average of 35 Mbps. The image is sharp and clear, showing no distracting grain or defects from the source materials. This is a well-balanced transfer, as the image is never overly dark or bright. The lush greens of the forest look great, as do brighter colors as well. The level of detail is notable, as we can make out textures on objects, and the depth is especially impressive, given the woods an ominous look. The Disc carries a DTS-HD Master Audio 5.1 track which runs at 48 kHz and an average of 4.0 Mbps. The track provides clear dialogue and sound effects. As one would hope, the audio makes great use of the forest setting, as the front and rear channels are filled with strange noises coming from the woods. We get some nicely done individual sounds here, most notably whispering voices. The "shock" moments provide notable subwoofer action. The Forest Blu-ray Disc contains only a few extra features. We begin with an AUDIO COMMENTARY from Director Jason Zada. "Exploring The Forest" (8 minutes) offers comments from the creative team and the cast, who talk about the story and characters. Zada recounts his visit to the actual forest and how that influenced his approach to the film. We get a few moments of on-set footage here. But, the real revelation comes with Producer Tory Metzger states "Jason came to our attention because he's a great storyteller". OK. There are five GALLERIES -- Behind-the-Scenes Photos, Set Illustrations, Visual Effects/Make-up Concept Art, Model Cave Photos, and Storyboards.